Well, here we go on the final leg of a quest to reach 4-12 for a third straight time. Let's keep the Clown Car on ice and break the Broncos. Go Raiders! 1. I was there, and it was a blast. As always, the tailgate was the best in sports. The festive energy and unquestioning camaraderie and endless plumes of smoke from smoking meat and kids throwing balls with their dads...I know folks want a new stadium (and the team is essentially demanding one), but be careful what you wish for. This type of open tailgating is becoming extinct, and it will be a shame if the day comes that Raiders game tailgating is scaled back or eliminated. 2. The Raiders came to win yesterday. They were fired up from the start. These players really seem to understand the privilege of playing for such a rabid fan base, and make an effort to fire up the crowd at the right times. 3. I was a little disappointed to hear the home crowd loudly booing Schaub when he came into the game briefly for a hobbled Carr. Schuab may not be a good quarterback anymore, and you can be disappointed in the fact that the Raiders saw fit to sign him for so much, but by all accounts he's been a good soldier, and his sample size this season has been pretty small. Not a guy I would boo for just coming into the game. 4. 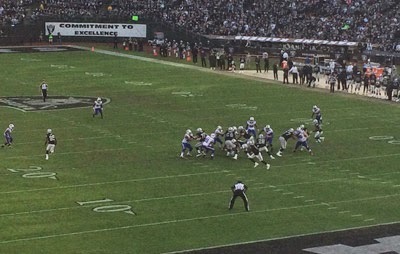 That 50-yard strike by Carr to Holmes on third down with five minutes left was epic. Carr's arrow is pointed up, and he is a joy to behold. After going to so many games and seeing the likes of Kerry Collins and Andrew Walter and JaMarcus Russell and Jason Campbell and even Carson Palmer, it's nice to see a Raiders quarterback who is visibly jacked up to be out there, and always engaged. 5. That's three home wins in a row. Beating the Broncos in Denver next week to eke out a 4-12 record is a tall order, but what began as an awful season has become a little more palatable with a dash of minty fresh, thanks to these three wins. Greetings from the Coluseum! Go Raiders! 1. More like a one-word take: Meh. That's how I feel about the game. Not a Clown Car edition, but a weak, uninspired effort. This team has given us some exciting moments, but it's not a good team, and there's a lot of work to do in order to make it a good team, starting with a new coaching staff. Time to stop with the bargain basement coaching hires. If this team is truly on the right track, there should be no problem attracting elite coaching talent. Most confident, elite-level coaches love to walk into situations where things are on the right track and there's nowhere to go but up. If things aren't perceived to be on the right track, however, that could complicate things. Either way, Mark Davis needs to pony up and make it happen. The fans have done their part, packing the stadium during yet another lost year. Time to invest some of that goodwill revenue into an elite coach. 1. Maybe, just maybe, we witnessed a pivot point in the fortunes of the Bay's two NFL football franchises. 2. I sure thought I heard Carr scream "Dang!" after the Raiders racked up a delay-of-game penalty. Dude is even wholesome when he's pissed. 3. Mack and Moore...From their farcical celebration against the Chiefs to their in-your-face takedowns of Kaepernick, those dudes know how to make noise, and they're looking like they might be two badass building blocks for the future. 4. Say what you will about Tony Sparano, he's demonstrating and eliciting more passion that Dennis Allen ever did. As far as Harbaugh is concerned, I wouldn't let the Niners' fade this year dissuade me from considering him. This is his M.O., everywhere he goes (San Diego University, Stanford, SF), he wins, but over time he rubs people the wrong way and maybe the players start to tune out or the organization begins to tire of him. But there's no denying his ability to walk into a dicey organization (or college) and right the ship and win. 5. 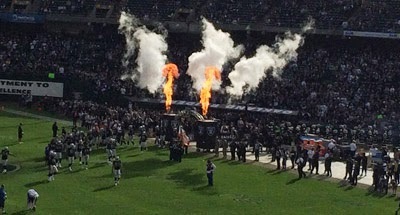 What we need next is for the Raiders to finish strong, to show that the Rams game was an anomaly, and that this team isn't some 2-14 outfit with a few flukey wins, but rather a different kind of 4-12 team than the last two editions. Well, this could be a good, close game based on the Niners' recent play (that is, of course, if the Raiders aren't "tanking"). Let's GO RAIDERS!